图片来自IMS Global Learning Consortium, Inc. The Common Vulnerabilities and Exposures (CVE) project has assigned the name CVE-2015-6960 to this issue. This is an entry on the CVE list (http://cve.mitre.org), which standardizes names for security problems. The bug was fixed in this commit. Experience API (也叫 xAPI 或者 Tin Can API) 在2013年4月完成1.0版本. API的经验解决的许多问题固有的SCORM的旧版本. 就像SCORM,ADL是经验API的管理者。 AICC 使用CMI-5计划利用 xAPI 作为他们的运输标准,但AICC成员决定解散组织和转移CMI-5 ADL. The Experience API (Tin Can API)是一个web服务,它允许软件客户阅读和写作经验数据的形式“statement”对象。最简单的形式,形式的语句是“I did this”,或者更一般的“actor verb object”。可以使用更复杂的表述形式。还有一个内置的查询API帮助过滤记录报表,和一种API状态,允许使用应用程序的“scratch space”。经验API声明都存储在 数据存储 也叫 学习记录存储, 它可以存在于自己的或是在学习管理系统. 2009 —前三个规格书作为技术报告 ISO/IEC JTC1/SC36, ISO/IEC 标准编号 TR 29163. ADL awards a 广泛机构公告书（BAA） to Rustici软件 进行研究和社区访谈,以创建下一代SCORM的开始。 这就是所谓的Tin Can 项目. 2011 9月 — 下一代的SCORM的初稿(叫做 Tin Can API) 发布. 2013 年4月— 1.0.0 版本发布，项目被改变为”Experience API” 或者 xAPI, 但许多人仍然把它作为 Tin Can API. Jump up^ “Technical”. SCORM. Retrieved 2014-12-22. Jump up^ “SCORM — Project Tin Can: Phase 3 — Capabilities”. SCORM — Project Tin Can: Phase 3 — Capabilities. Rustici Sofftware. Retrieved 27 August 2012. Jump up^ “Tech Overview – Tin Can API”. Tech Overview – Tin Can API. Rustici Software. Retrieved27 August 2012. 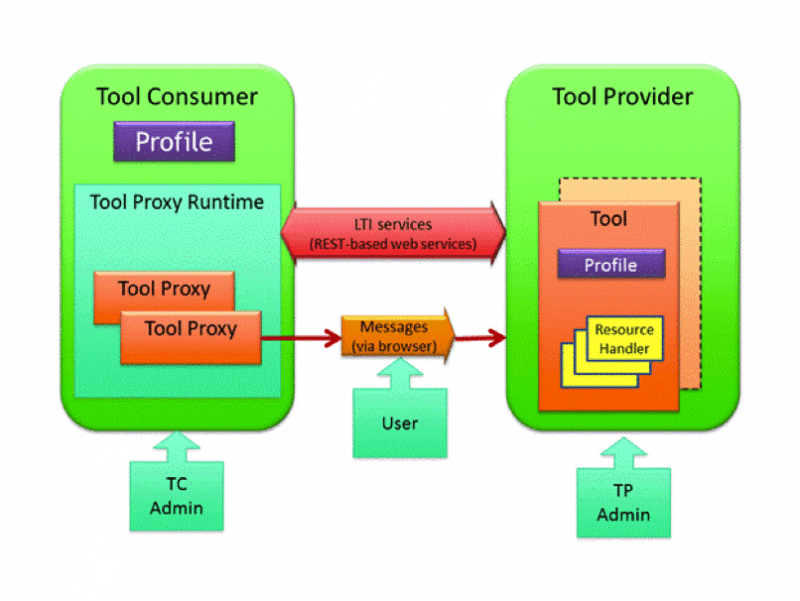 Learning Tools Interoperability (LTI) 是一个由 IMS Global Learning Consortium创造的标准 . “Learning Tools Interoperability”. IMS Global. Retrieved 2015-09-07. “IMS Global Learning Tools Interoperability Version 1.0”. Imsglobal.org. Retrieved 2015-09-07. “basiclti4moodle – Implements a IMS BasicLTI Consumer for Moodle – Google Project Hosting”. Code.google.com. 2012-07-02. Retrieved 2015-09-07. “Learning Tools Interoperability®”. IMS Global. Retrieved 2015-09-07. “IMS Global Learning Tools Interoperability Implementation Guide Version 1.1.1”. Imsglobal.org. Retrieved 2015-09-07. “IMS Global Learning Tools Interoperability Implementation Guide Version 2.0 Final”. Imsglobal.org. Retrieved 2015-09-07.